I have been procrastinating putting the handles on my Fat-Bottomed Bag for over a month now. This was mostly due to the fact that I ran out of wool when I had the body of the bag completed, and had none for the handle-holders. I got the wool over five years ago and has been long discontinued. 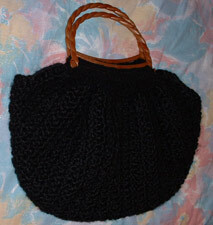 But, since it’s black, I dug out some other black wool I had and finished it up in half an hour on my tea-break. 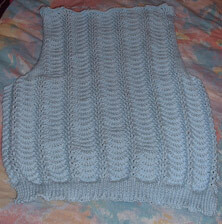 I think a nice, bright lining and a matching crocheted flower on the front will finish this off! I didn’t have the time today to tackle the attrocity that is the neck hole of my purple jumper, but I finished off the back of Alouette after my dinner. Recently, on one of my podcasts, I heard that you can do a series of three courses for your Master Knitter certificate through the Knitting Guild Association. I was looking at the criteria, and it looks like it would be really interesting to do. Level Three would be great; you have to design your own aran or fair isle jumper, research six different fibres, and knit swatches demonstrating techniques I don’t know how to do yet like invisible cast on and cast off. You have to do book and magazine reports too (yessssss!). It would be so much fun! It just makes me mad to go into a shop like Hickey’s, one of the only places in town that sells wool, and have to put up with their disgrace of a wool department. It’s pathetic. Where’s the sock yarn? Where are the easily-available and not-much-dearer brands like Rowan, Collinette, Opal, Noro, Laines du Nord, Bergere de France, Phildar, ggh? And magazines such as the very excellent Rowan mag, Vogue Knitting & its various spin-offs, Interweave Knits/Crochet (see this month’s? delicious), Rebecca… Instead of the exceptionally crap Simply Knitting and Knitting monthly magazines. The people working there don’t know the difference, and it makes me mad that none of the consumers I see in there find the selection disappointing. Dublin needs a textile and fibre megastore! This is the best anti-vampire jumper ever….better than onions and garlic together! because you’ll never get your head even through the neck hole! I was a bit zonked out this evening, so I just kept decreasing away. I was half paying attention to Elizabeth Zimmerman’s advice about shaping the back of the neck: she says to keep the front neck stitches on a life-line, and then keep doing decreases on the back neck stitches until the portion of stitches for the arms have been decreased into oblivion. It makes sense, and even looks right, except that I can’t even fit my HAND through the hole, let alone my head. However, I tried it on, and whilst I was in there, it felt nice and roomy otherwise. 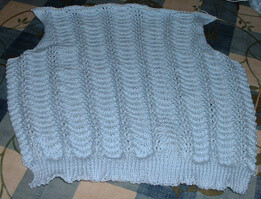 You can see the purl rows on the front there that I was on about in my post yesterday. They’re pretty. I think I might rip back about 20 rows (don’t panic! this includes the back neck shaping) and try it again from there. I didn’t really feel like doing that again tonight, so I mattress-seamed up one of my arm holes. I know invisible seams aren’t exactly the most spectacular things to look at, but here’s a picture anyway. On to the WIPs! 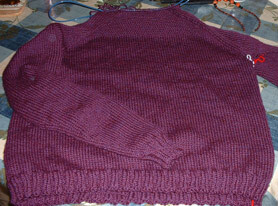 I have been working away on the ole purple jumper. I finally reached the part where I get to do a bit of neck shaping this evening – by neck shaping, I mean adding a little bit to the back so the front is a little bit lower in comparison. After that, all I have to do is some ribbing and graft my arm holes together. Piece of cake! … Except I only have about a meter of wool left! Should I finish it off in another colour? Or should I go out and buy another gigantic ball (it is a great colour, after all)? What should I do? 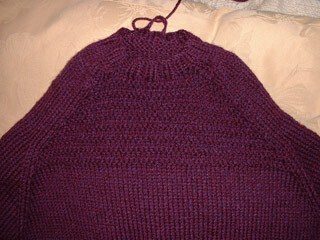 If you look really closely, you can see some purl rows I put in between the raglan decreases. I put them in for two reasons. One, to differentiate between the front and the back because I was getting lost (it doesn’t take much). Two, it looks pretty! I wanted to take a detailed shot of the purl rows, but my camera batteries screamed for mercy and gave up the ghost, so it will have to wait until another day. Here is the back of Alouette, almost complete. It’s for my mother’s birthday next month. I got really stuck at the armhole shaping. This was mostly due to my intense fatigue than anything else. Lace really boils my blood when I’m tired and I don’t understand why it goes wrong! The problem lay in the fact that I had to cut out some of the pattern to make room for the shaping, and obviously, I had to cut out the proper amount in order to maintain the lace pattern. I figured that out ok, but getting my pattern realigned correctly took about ten attempts. It was aggravating, but the good thing about it is that I feel like I understand how to go about aligning things a bit better now. Something quick to finish. If you love buttons as much as I do, check out this Button of the Month Club. It’s $18 for a six-month US and international subscription, and you get three hand-made limited-edition buttons each month. Check it out, they look great! 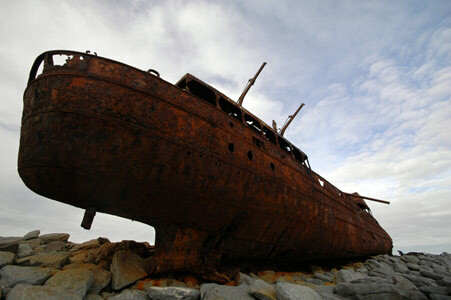 As I said in my last post, we arrived on Inis Oírr on Good Friday. This was taken from the highest point on the island. The old ruin you see was a lookout tower. 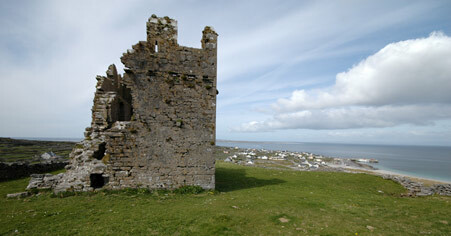 To the right of the tower in the background is the harbour, and you can see Inis Meáinn in the distance. As you can see, the island is well-populated, with approximately 300 permanent residents. You can’t see it very well in this picture, but to the left is the airstrip. You can get an air-taxi from Spiddal or Galway. On Good Friday, planes were landing every fifteen minutes or so. Most of them were little two- or four-seater planes. There were about four or five men working down at the airstrip. Beside the runway is a fire station. Alb and I were wondering how the islanders get their fuel, and how they get vehicles out to the island, because there was definitely no room on the passenger ferry. We asked Bríd Póill, who runs the B&B, about it. She said that vehicles are brought over on a bigger supply ferry, and to bring a car over costs about e80. All vehicles on the island run on diesel, and they buy it from the tanks down by the fire station. The supply ferry comes every day during the summer, and three times a week during the winter. We were asking Bríd how she did her shopping, as there is only a small shop on the island. She said she had an account with the supermarket on Inis Mór; she rings them up, they send it on the ferry, and she has it by the next day. I’m sure it works perfectly during the summer, but I imagine that during the winter, in bad weather, you’d want to have some provisions. 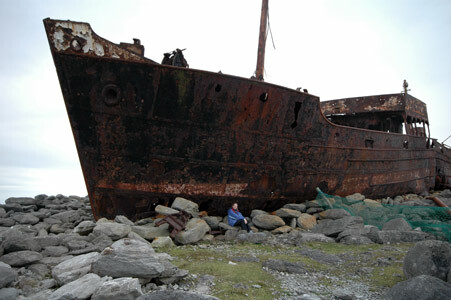 This is the wreck of the Plassey which ran ashore in bad weather during the ’60s. The islanders rescued the entire crew. Bríd Póill has a collage of photos taken during the rescue. The sea was frighteningly high, and the crew was pulled ashore with ropes. You can see what the ship looked like; it has been badly corroded since. It was washed further inland in another storm since, so you can actually walk around it. See me in the blue coat? This will give you an idea of how enormous it is. Since we last visited the wreck, one of the masts has fallen off and all the graffiti has been corroded off. 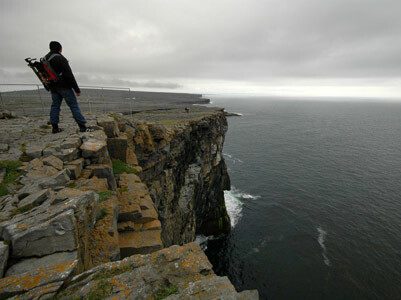 This was taken from Dún Aengus on Inis Mór. It is a cliff fort built millennia ago. I say millennia because half of the fort has been eroded away! 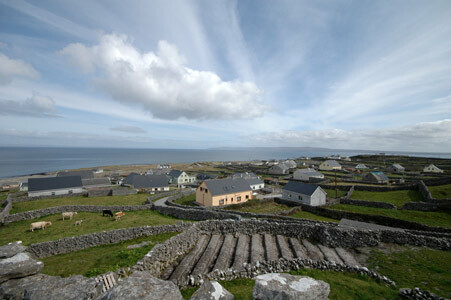 There are about 900 permanent residents on Inis Mór. In the 1900s, there were close to 2,500 people on the island. They were encouraged to clear the land of stone and build the stone walls for which the islands are famous. There is about 7, 000 miles of stone wall on Inis Mór alone. They are used as boundary walls because the land is divided up evenly among the farmers so that nobody gets all the bad land or all the good land. There is a priest resident on Inis Mór, and he makes flying visits to the other islands during the week. The last priest there learned to fly and had his own two-seater plane. There are three primary schools on the island and a technical school too. I was expecting a quiet week, but things have turned out to be pretty crazy. I keep hoping that things will quieten down a bit but until I get my chamber music exams over and my end-of-year sorted (long story), I can’t see it happening for a while! I am still in Galway, so I am afraid this will be a text-only post. We had such a good time on the islands! We got the 1030 ferry out to Inis Oírr on Good Friday, and reached Bríd Póill’s B&B around noon. She made us tea and fresh hot scones (yum) which kept us going for a while. We walked the entire island, which is about 4 miles by 3, and got thoroughly sunburned. Because it was Good Friday, only the hotel was open, and no bar was serving. There was no other place to eat, so the hotel was mobbed that night. It took us about two and a half hours to get through dinner; there was only one proper waitress. It didn’t matter much because there was no place to go afterwards. We met the family staying in the B&B with us later in the evening. The father was like Tony Soprano’s brother, it was pretty funny. They were nice though, and were showing us pictures of dolphins that had come in with the Doolin ferry. There was no sign of the knitting shop I’d been in the last time. I figure that she hasn’t opened up for the summer season yet. Try the website – although it wasn’t working for me. She does intensive 3-day knitting, crochet and weaving courses. From what I could glean from the cached text on Google, you spend a day on Inis Meáinn doing crochet, which sounds like fun. I saw some examples of the weaving on Inis Mór, and I would really like to learn how to do it. I think I will try ringing the number listed for more information. When I find out how much these courses are, what they entail, and if materials are provided, I will put the information up here. It sounds like a really fun holiday, especially if you dig your knitting and crochet. I would really like to think that someone from abroad read about the workshops here and went to one, and had a good time. We walked almost the entire island. We found a buried church and went back to the shipwreck. I will post pictures and more about the island when I get back to Dublin On Saturday, we got the Doolin ferry to Inis Mór, which was just mobbed with tourists. Inis Mór is definitely becoming more like the mainland – there’s a Supermac’s on it, like – but in a way, it pleases me to see tourists from so many different places there. I heard French, German, Spanish, Portuguese, Chinese and Japanese there. Last time, we cycled around the island. This time, we were really tired from walking around Inis Oírr so we took the bus tour instead. We decided not to overnight on the island. The guide was full of interesting facts about the islands. 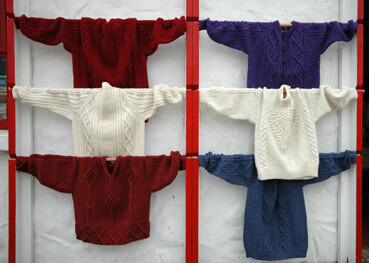 There were many little shops selling a variety of tourist tack, of course, but the selection of knitwear was amazing. I love just looking at the stuff. I’d never buy something I could knit myself! I really like how every single item of knitwear you see in the shops has been handknit by someone on the island. I bought some wool on Inis Mór (of course) and was asking the woman in the shop about it. She said since they don’t have sheep on the island, the wool they use is shipped in. There are no tourists during the winter, and that’s when they do all the knitting. I had fantastic daydreams about whiling a winter away just knitting aran jumpers on the island lol… It would probably be really depressing. All that rain with nothing to do and nowhere to go. Anyway, back on the mainland, I called into Yarn, which remains my favourite ever wool shop. I got more cotton for my mum’s top, some felted tweed for Salina, and I found the most delicious ball of mohair. You have to see it to believe it!!! Finally, got my hands on the Spring/Summer Rowan magazine too, which is a mixed bag I have to say. What is with the eco-warrior thing? Myself and Alb were laughing over some of the ridiculous photos in it.